We’ve become pros at picking out a Christmas tree from the Wal-Mart parking lot – check in the back of the lot, look for vibrant colors and pray for clearance tags… but this year our family decided to brave the frigid mountain air, the wild animals and the snowy pathways to cut down our very own live tree. I donned my rugged big girl boots (and my long underwear) and Brian, Sam and I climbed into the truck. We picked up our good friend Andrea and stopped by the permit office. The city wants you to cut down trees to help with fire control, but you have to get a permit and pay $10 per tree. Brian went in and came back out smiling. Sam asked him what was so funny. He looked over at me and I plastered a grin over my look of wide-eyed fear. “Sliding into a ditch? Getting stuck? No problem. What’s Christmas without a little adventure?” I hoped no one would notice that my voice was several octaves higher than normal. I was really just trying to drown out the crazy woman inside my head: We’re going to die. We’re going to die. We’re going to find the perfect tree, cut it down, load it into the truck and then slide into a ditch and die. Oh yeah baby. Merry Christmas. We stopped by Lowes to pick up a saw. Brian was on the phone, so I confidently picked out the biggest saw I could find. He shook his head as he pointed to a saw half it’s size and twice as thin. The sun was shining brightly and the temperature was heating up. I could see water on the sides of the roads as we cruised up into the foothills. Maybe it would all melt? Oh Lord, let it all melt. We made our way higher and higher, to the area of the Christmas trees. My mountain man’s driving was perfect. 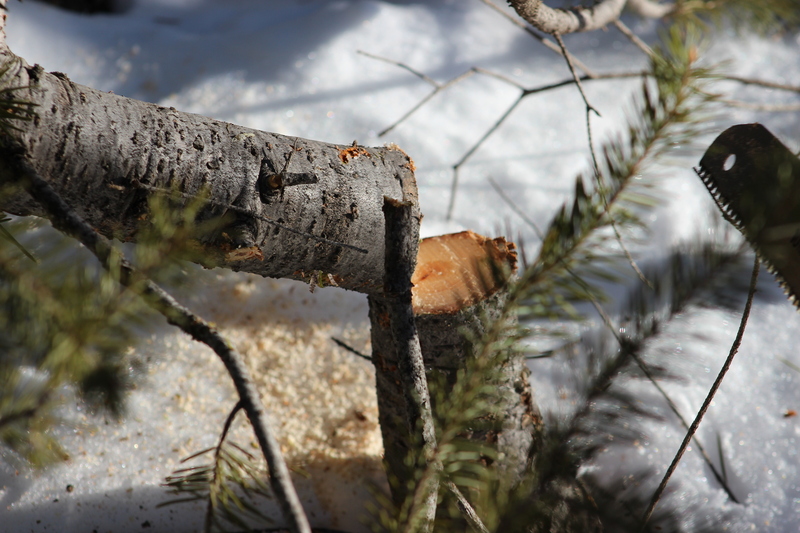 We found the most beautiful trees, and it took all of two seconds to cut them down with the saw Brian had picked out. We didn’t starve. We didn’t freeze. We didn’t die. I’m sure there’s a lesson for me to learn in all of this, so I’ll be sure to think on it. But for right now, there’s a cool mountain tree that needs decorating and a rugged mountain man that needs smooching. And yes, I think we’ve found a new tradition. This entry was posted in Uncategorized and tagged Christmas in Colorado, christmas trees, Christmas trees colorado, cutting down live trees, Elsa Colopy, Elsa Kok Colopy. I miss Colorado! 😦 You are so blessed… in many ways. TOOOO funny!!!! While reading this I was thinking just maybe I shouldn’t have shared my blizzard story with you. LOL!! I am sooo glad you have a REAL tree and a REAL man … MERRY CHRSITMAS!! Oh, and does it smell good? I had a conversation with that same women at the Forestry Office!! She quizzed me too and made it sound like it was do or die! 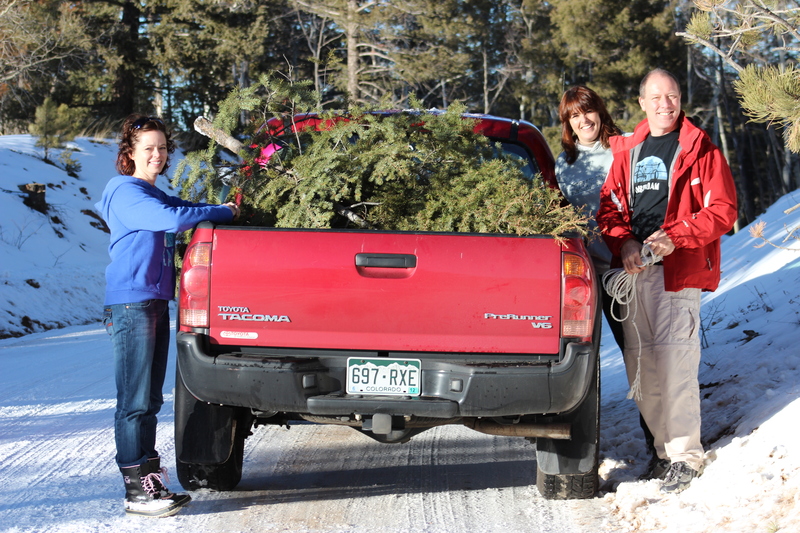 I took my in-laws & children along with my sister and parents and we had a wonderful time cutting down 3 trees. We brought hot cocoa/coffe/cider for after and it was great. We are going to make it a Christmas tradition (as long as the Air Force keeps us in CO). So great to hear about your wonderful adventure and your new saw! very nice! I’m glad you were able to find a tree and in the end trust your husband and God….. Thanks for letting me live your adventure without having to put my boots on! Praising God that you survived, had a great time and found a great tree!! I love hearing about all your adventures – thanks for sharing your part of the world and your life with us!!! !